… is just not long enough! I’m already missing London. This trip was so much fun, I loved seeing Caitlin and Kellie and the weather was beyond perfect. 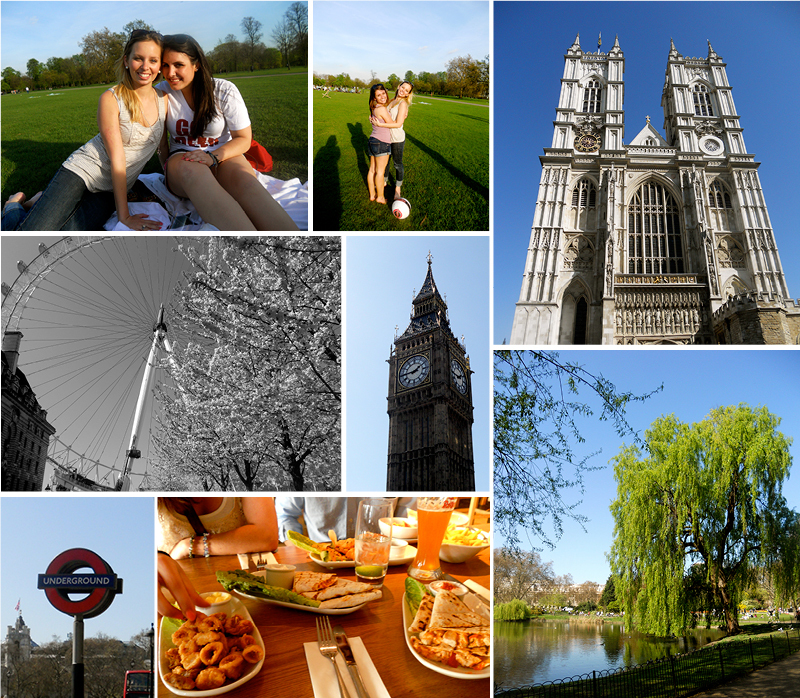 I had four days in London and after this experience I have a feeling I may be moving there at some point in my life. Day 1: I arrived in London on Thursday and after nearly losing myself in the train station, I hung out in Caitlin and Kellie’s dorm while they finished their classes for the week. It was nice to take a second to collect myself. The girls are in a program that is a lot different than mine. They stay in a dorm with tons of other American students living in London. They have a computer room and cafeteria among other amenities. I chose to study in Paris because I wanted to immerse myself in another culture but I must say I’m kind of jealous that they are getting a university experience, and even if the students they are bonding with are American, they are having a blast and making such great friends. After her class, Caitlin and I grabbed some Whole Foods for lunch. Right around the corner, they have this ginormous Whole Foods fully-equipped with a food court. Yum! We spent majority of the rest of the day hanging out in Kensington Park in the sun with some wine. I was so excited that I didn’t use my umbrella once the entire trip! Oh, p.s. the train station I came into has a Platform 9 3/4 like in Harry Potter that you can take a picture with! Day 2: On Friday we woke up and headed straight for Big Ben (the famous clocktower) and the London eye (a huge ferris wheel over the Thames). We didn’t go up because we figured we would go see majority of the sites on foot and we were getting hungry for lunch. We got a spread of 5 appetizers to share (a special at a restaurant across from the London eye) and I even tried calamari! It got spit back out into my napkin immediately. I was not a fan of the chewy texture. After lunch, we headed to St. James’ Park to relax for awhile. We were able to walk through the park to Buckingham palace. I was sad I didn’t get to see the guards up close. They are pretty far back from the gates that keep the public out so I couldn’t even get a good picture. All the gardens in London were so colorful and I loved their preference for Chi O colors. All the gardens were filled with red and yellow flowers. From the park we walked to Westminster Abbey, the church where Kate and William will soon be married! They had every possible souvenir you could think of with Kate and William’s face printed on. We headed back to the dorms to shower, eat dinner and get ready to go watch a basketball tournament that the boys in Caitlin and Kellie’s program were playing in. As it turned out, the tournament was pretty far away, so after a tube ride, bus ride and tipsy walk up and down the streets of suburban London we found the gym after the tournament ended. Luckily some of the boys lived in a flat nearby and invited us over for a party, so our trip wasn’t a waste. They had Nintendo 64 and I had forgotten how much I love Mario Kart haha. We never made it out to a club but had a blast playing video games and later watching Harry Potter at the dorms (when in London…). Day 3: On Saturday we had planned to visit the markets (London has quite a few famous markets), maybe do a few museums and then play in the park again. We grabbed some brunch from whole foods and visited H&M. I know, I can get H&M in America, but I found a really cute trench coat on sale and since Europe has been warmer than I expected I need a jacket lighter than my peacoat. Afterwards, we found out that AIFS, their study abroad program was hosting a BBQ (who turns down free food?) so we postponed the markets. The BBQ was great, I love how friendly everyone in their program is too. I haven’t really gotten to know anyone in my program… but that’s partially my own fault. The market we chose to visit is called Portobello Market. The store fronts and local houses are really cute, all painted in various pastel shades. Some of the stores had really great antique items as well, but in the end I just grabbed some souvenirs for friends. That evening we went to Sports Bar for dinner and the Red Sox-Yankees game. It was interesting how this place had a sports bar feel but also bumping dance music at the same time. We spent the rest of the night in the other AIFS dorm because we had to mentally and physically prepare for The Church the next day.